If you've read much or any of the other annual journals on this website you know that Jim and I live a lifestyle that is becoming increasingly popular with retirees and even younger folks who are still working -- traveling around North America in our RV most of the time. Our "ideas of living" have changed since our retirement ten years ago, when we mistakenly assumed we needed a home base somewhere. We've learned a lot about our need to explore since then. Because we're frequently on the move and stay pretty busy I didn't get around to writing this introductory entry until the end of the year. For the sake of continuity, however, I'm dating it in mid-February. I'll date the remainder of this year's entries in a similar manner, close to the time we were in the various locations I'm talking about and not when I actually wrote them (journalistic license!). Many of this year's entries will be summaries to make it easier for me to get caught up to date. If you've just discovered our website and this intro doesn't satisfy your curiosity, there are longer introductions at the beginning of each annual journal since we began the site in 2005. 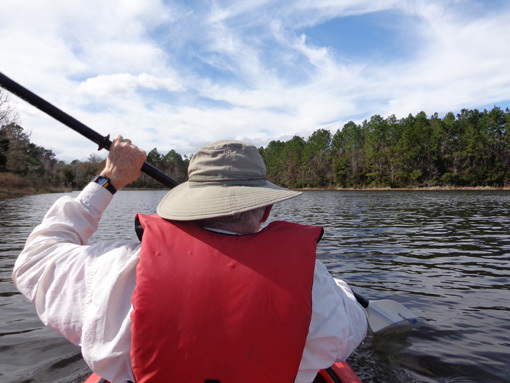 Our lifestyle and activities have morphed over the last decade as we've aged from our mid-50s to our mid-60s. We are Boomers who haven't reconciled with the concept of middle age, let alone senior citizenship. We know we "aren't 35 any more" but we by gosh aren't ready to act like Olde Pharts yet! Our dream of traveling full time and not just 3/4 time in our RV hasn't changed -- we plan to finally sell our house in Virginia this year -- but bum knees prevent us from enjoying the trail running and racing that we both loved for 30+ years. We remain physically active, however, with our cycling (Jim) and hiking (Sue)adventures. 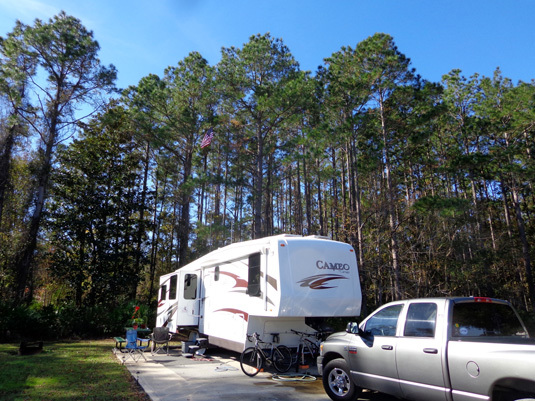 our campsite at Air Base Charleston (SC) in November, 2013. Cody, a male black Lab, is almost 11 years old now but still has some puppy left in him. 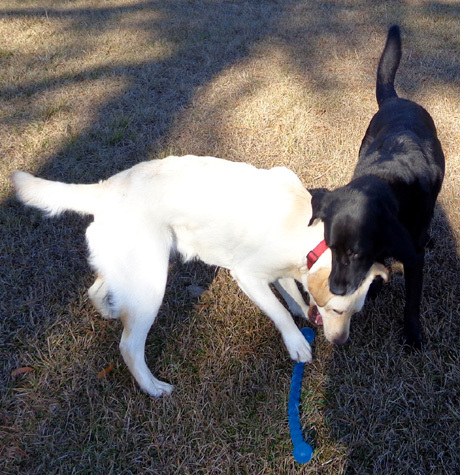 Casey, a cream-colored yellow Lab, is a furry ball of hyperactivity at 18 months. 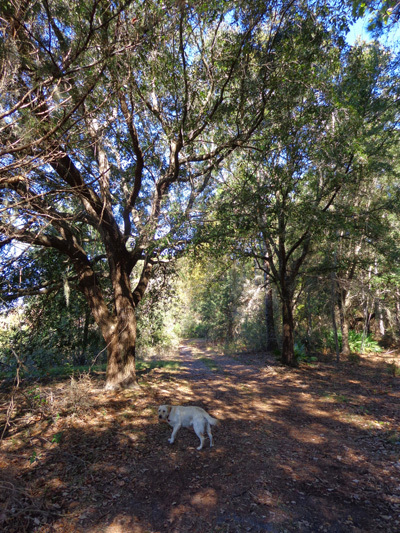 Even though I take Casey on long daily walks or hikes she still pesters Jim to play ball with her (she's a retriever, after all) and "reminds" him when he forgets. She also loves to run beside him on short bike rides. Jim and I want to stay mentally and physically fit until we die. Since we don't know when that will be, we try to live each day like it might be our last one. Considering our proclivity for adventure and all the time and miles we're on the road, it well could be. 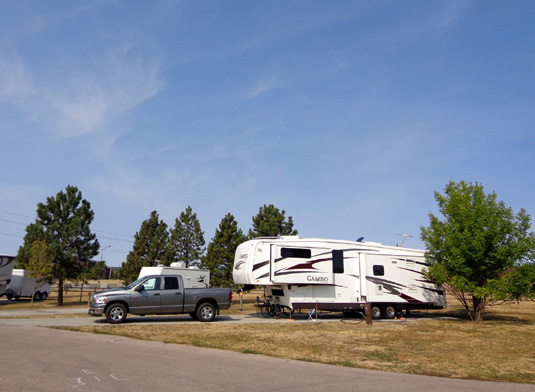 Our website primarily focuses on our travels in a 36-foot Cameo 5th-wheel camper and some of the activities we enjoy at each location we visit. I want the site to be a source of information (and occasional amusement) for folks who like to travel, particularly in an RV -- routes and road conditions, campgrounds where we stay, interesting things to do and see at each destination, some local history and culture, recreational opportunities like hiking trails and bike paths, and whatever else I feel like writing about. For privacy's sake I don't include much about our family and friends, controversial topics, or even all of our activities. I seldom write about shopping or eating out, either, because what little shopping and eating out we do is seldom noteworthy. We choose to live a pretty simple, quiet, and frugal lifestyle. Since I enjoy photography as much as writing, this site will continue to be chock full of scenic photos of the places we visit, as well as the flora, fauna, geology, and other things that catch my eye. We love camping in the Rocky Mountains in the summer. 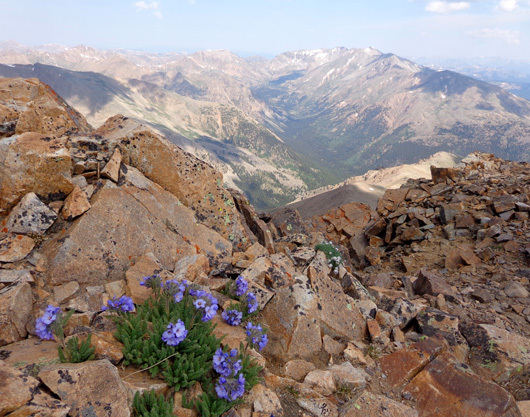 The photo I chose for this year's page headers is Mt. 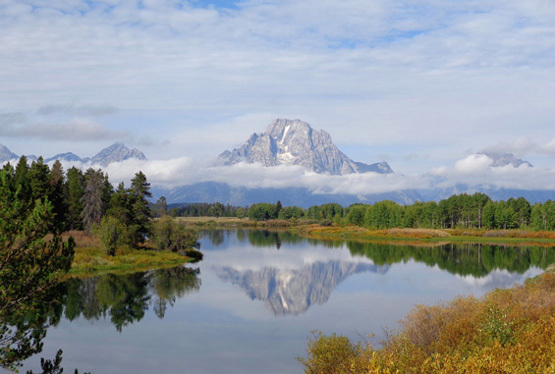 Moran reflected in a lake at Grand Teton National Park in Wyoming. One of these days I'll get a Big Girl camera -- definitely before we visit Alaska again -- but for now I'm mostly pleased with the 16-megapixel, 16x-optical zoom Sony Cyber-shot that I've been using the last 20 months. It's easy to carry when I hike and bike and part of my KISS philosophy. DSLRs are not simple. 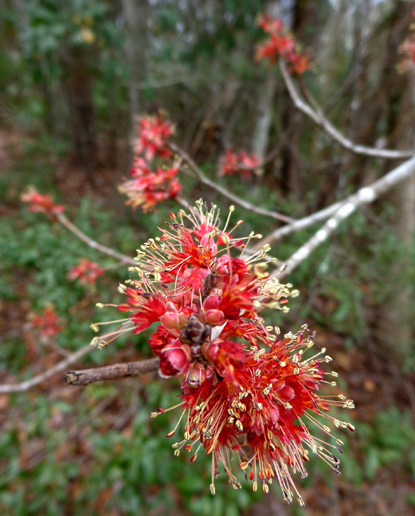 After spending the winter months in mostly-warm southwestern states for several years we've been snow-birding in southern Georgia and northern Florida the last three winters. 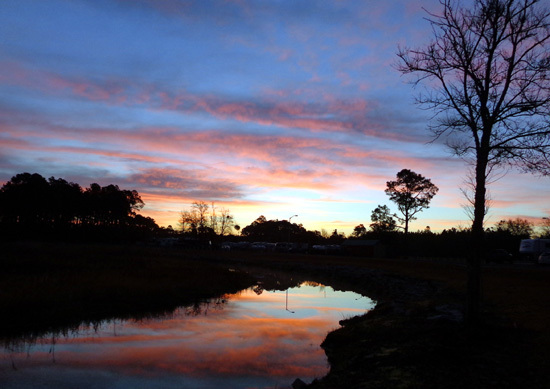 Our favorite winter destination in this area is Eagle Hammock RV Park on Kings Bay Submarine Base near St. Marys, Georgia. 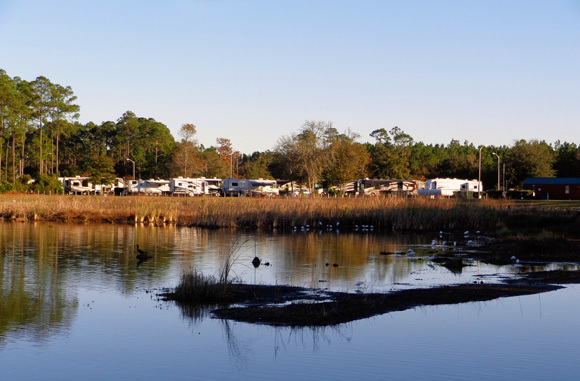 The campground is only a few miles as the crow flies from the Florida border and less than a 30-minute drive to metro Jacksonville. 2010 Cameo 35SB3 5th-wheel towed by a 2008 diesel Ram 2500 3/4 ton truck. This is our third time to camp at Kings Bay. 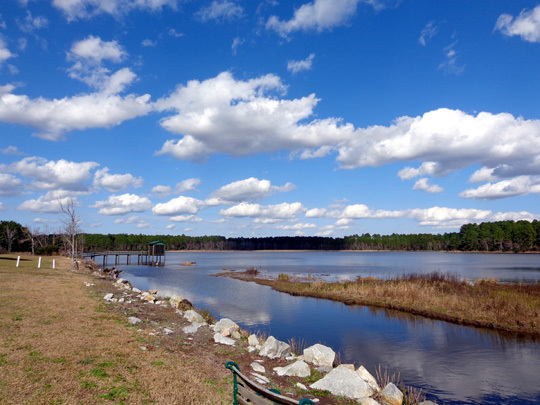 Some retirees have come here every winter since the campground was built nine years ago, and some active-duty families live here year-round. It's nice to re-connect with people we met here last winter season. Military retirees can reserve a site for up to four months at a time in the winter, and longer in the summer if they like hot weather. We stayed here a total of six weeks in February and March of 2013. We came back on December 15 and will be leaving tomorrow. It's been nice to stay in one site for a little over two months. 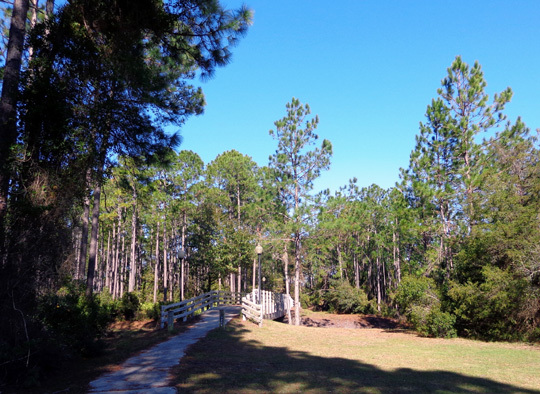 Eagle Hammock is one of the highest-rated military campgrounds in the country. 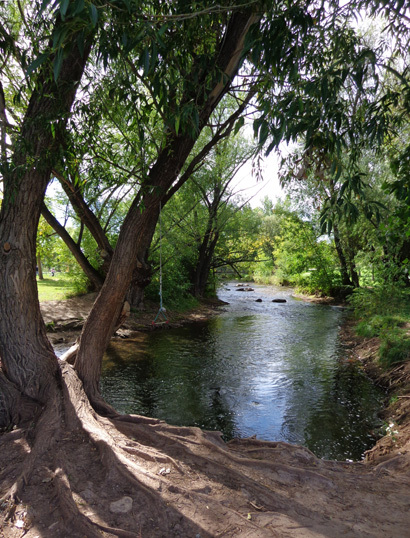 The location is scenic and convenient, the staff is accommodating and personable, the cost is very reasonable for a full-service site (even more so at the monthly rate), the sites are spacious and attractive, and there is no extra charge for cable, WiFi, and the laundry facilities. We also like the quiet setting. For all but one week (last March) we've had a lakeside site very close to the water. 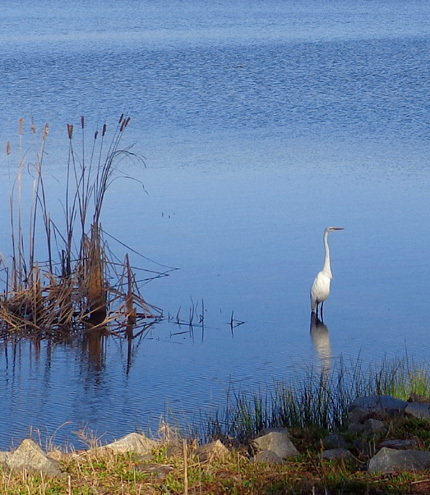 From our windows we can see white egrets, blue herons, wood storks, and other birds flying around, people bass fishing and kayaking, and alligators swimming from one island to another. 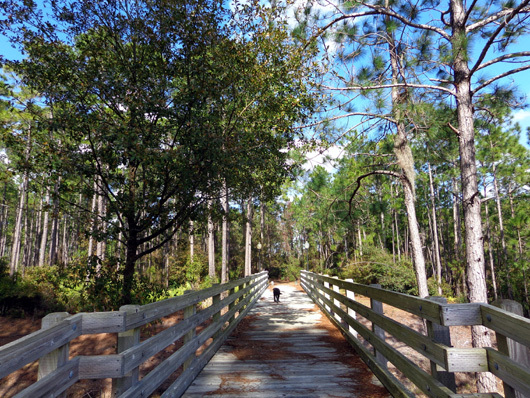 Because of the alligators we can't let the dogs into the water of any of the numerous ponds and lakes on the base but there are plenty of trails and bike paths where we can walk them safely. We also have lots of places on and off base to ride our bikes. 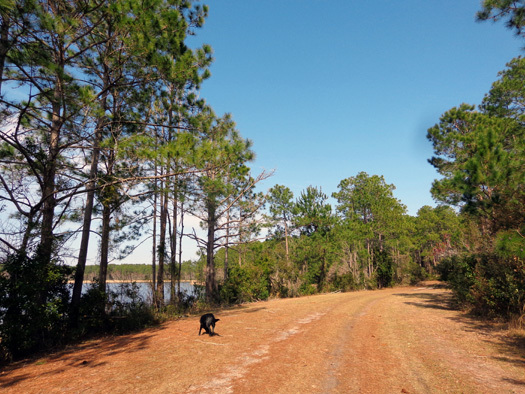 Last year when Jim was training for the Leadville 100-mile mountain bike race he was able to do training rides of up to 50 miles by combining paved roads, bike paths, and dirt trails on base, down to the historic town of St. Marys, and up to Crooked River State Park. 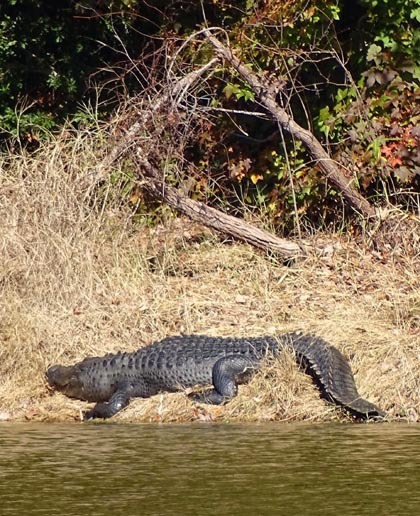 One of several adult gators in the lake by the RV park; we see them on sunny days. On cloudy days or when it's below about 50 F. they stay warmer under water. The weather this winter has been more variable than when we were here last February and March. We've had some days well above the normal low-high of 40s to 60s F. and some days well below that, too. Most days were clear and moderate enough that we were able to get out to hike and ride. Jim isn't training for as long of a bike race this year as last but he still does frequent 20-mile bike rides or longer on his Specialized 29er Stump Jumper mountain bike. His longest ride recently was 48 miles. I do a couple eight- to ten-mile rides a week on my Specialized Tricross cyclocross bike and walk the dogs from three to seven miles a day. Jim and I are the "old dogs" I'm referring to. We recently tried kayaking for the first time and we're sorry we waited so long to try this sport. 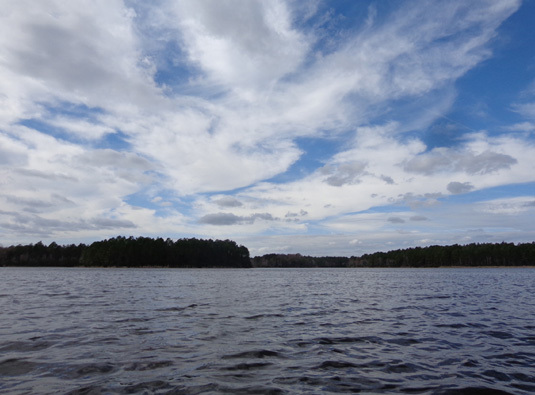 The lake by our campsite (Lake D) was a good place for us to learn the paddling technique on calm water. Initially I was a little fearful of the alligators. It wasn't the ones sunning themselves on the shore that I was concerned about; it was the ones we couldn't see in the water that we might run into accidentally. I soon forgot all about them and just had fun paddling around. our strokes in a two-person kayak! We did pretty well for newbies, though. of water by our campsite; sometimes the lake level is lower and this would be impossible. I always loved running in a foggy forest. 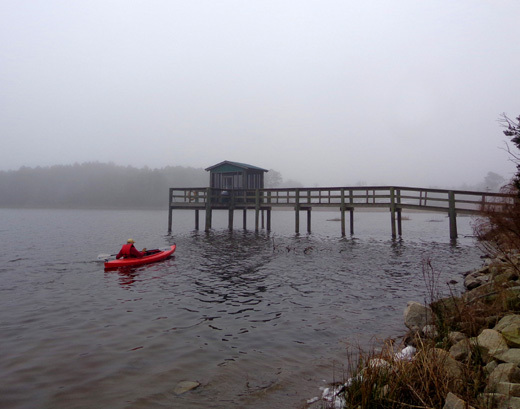 Paddling in sea fog was equally intriguing to me. 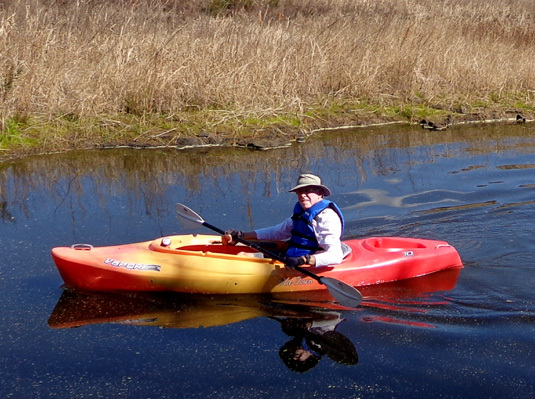 Now we're considering buying two small kayaks! It's easier for us to carry and paddle the single-seaters. I think we'd use them enough to justify the purchase but we aren't sure how to transport them. We have enough trouble hauling two bicycles. Kings Bay has a large commissary for groceries and other goods, as well as a Navy Exchange store (like a small department store). We also shop nearby at a WalMart superstore, Lowe's, and Publix in Kingsland, GA. Any Big Box store we want is 20-30 miles away to the north (Brunswick) or south (Jacksonville, FL and environs). The little town of St. Marys is just south of the base. 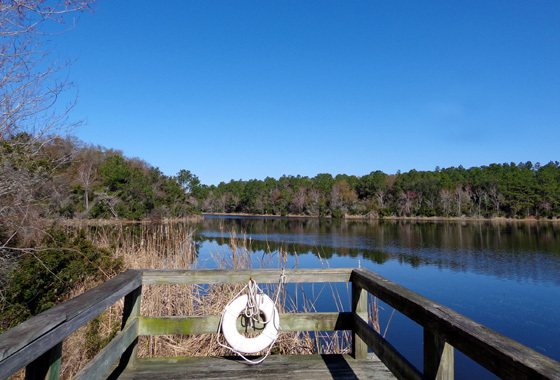 It has lots of tourist attractions, including the ferry that goes over to nearby Cumberland Island National Seashore. I took the ferry there twice last winter but didn't go this trip. 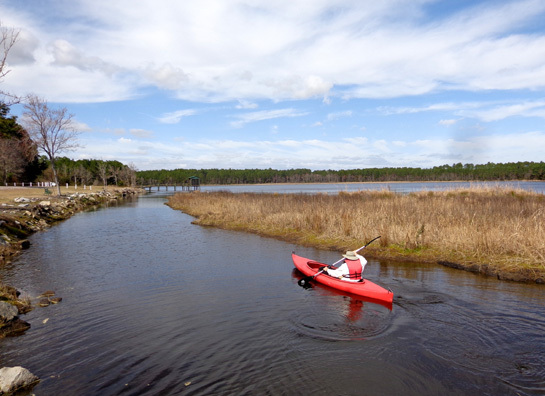 You can read more about St. Marys and Cumberland Island in the 2013 journal. 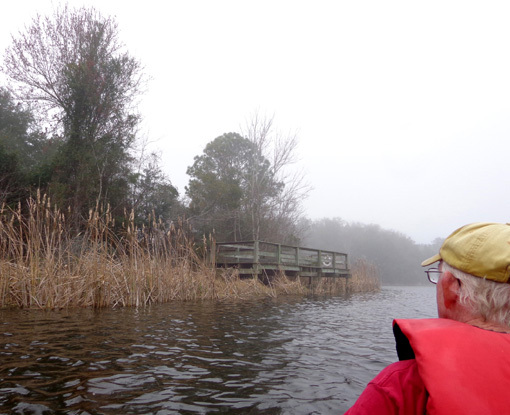 The Okefenokee Swamp is nearby, too. We highly recommend a swamp tour there. 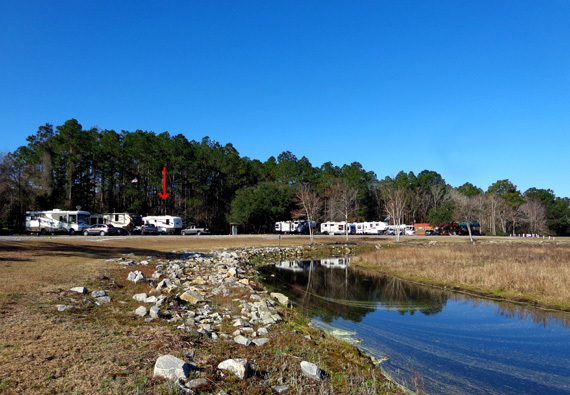 In addition to nearby attractions in southern Georgia and northern Florida, our RV park also offers a variety of activities for those who want to participate. Examples are pancake breakfasts, potluck suppers, ice cream or wine and cheese socials, New Year's Eve party, card games, exercise groups, movie nights, trips to local restaurants, music venues, or tourist destinations, and other events. Our focus this winter has been less on fun activities than on selling our house this spring. We have wanted to sell our house for the past six or seven years but didn't want to take a beating financially while the housing market in our rural area of southwestern Virginia was still depressed. Every spring since 2008 we've contacted several real estate agents in the Roanoke-Smith Mountain Lake area to get their market analyses, opinions, and "comps." Each year since 2008 the news for sellers has been depressing. Since we don't have to sell, we don't want to lose any of our equity. We did try a 60-day listing last spring but the response from buyers was so underwhelming that we let the listing expire. We left again on an extended "summer trip" to Colorado and put off selling the property for yet another year. This winter the housing market in our area appears to be improving to the point where it makes sense for owners like us to finally list our "shadow inventory" for sale. It's still more of a buyers' than a sellers' market but at least the scales are more balanced now than they've been since 2008. Our focus since we got to Kings Bay two months ago has been to research the housing market as much as possible online, talk by phone to seven different real estate agents in our area, and talk about what we need to do to update our house so it's more appealing to buyers (besides listing it at an attractive price). The most fun part of this research was our discovery in December of HGTV, a cable channel we've never watched before. Many of the shows are relevant to us -- not just the ones with remodeling but also the ones focusing on buyers because they give us a better idea of what people want (expect!) nowadays. We haven't bought or sold a house for ten years and we've been gone traveling so much during that time that we haven't kept up with current housing trends. I've spent hours almost every day watching these shows, getting ideas about what is popular and what is practical for us to do to update our 25-year-old house. It's been fun to plan what we want to do when we get back to the house. The actual doing won't be as much fun, I'm sure. 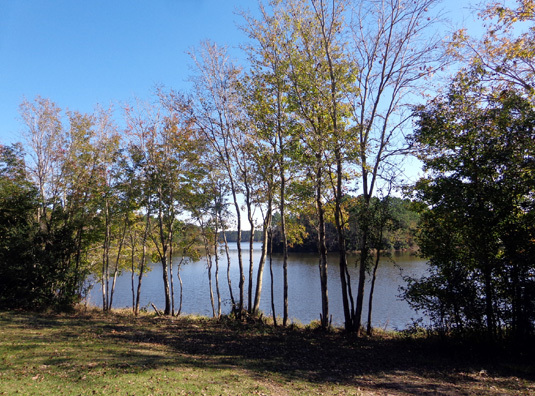 Fortunately we already have some desirable interior features like an open-concept living area and 12 acres of open and wooded land that should appeal to buyers who want to live in the country. The HGTV shows have shown to us how important it is to update our older appliances, however, and to stage the interior to showcase all the desirable features. Much of the work we can do ourselves. If we get a new roof (one of our top priorities) we'll have pros install it. We've done all we can do long-distance -- talked to agents by phone, began having roofers do estimates, looked at appliances, fixtures, tile, etc. at Lowe's and Home Depot, attended home shows in Orlando and Jacksonville, and a ton of other research. Because we have a lot to do at the house before we list it in mid-April (when the azaleas and dogwoods are blooming), we have cut short our "winter trip" by a few weeks. We are heading back to the house tomorrow. The timing to travel north is terrible because our rural neighborhood recently got a foot of snow (up to two feet in town). Although some of it has melted we aren't sure we can get the camper in our driveway yet. But we need to start meeting with roofers, take advantage of Presidents' Day appliance sales prices, and have several agents come out to assess our ideas about updates -- what will appeal to buyers and what is most cost-effective. So . . . back to the land of winter snows for one last time. We will sell the house this summer! !